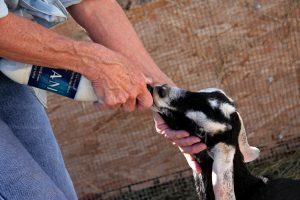 At this time of year, Merciful Maiden Critter Haven gets many calls to help motherless baby goats and lambs. They must be bottle-fed on a regular schedule. In Ollie’s case, his mother died en route to slaughter. Ollie and his baba ( bottle) are such a joy!